A handwritten letter in Arabic. Confirm baptism of Malecha (Maleka) AlDebis on November 10, 1893. Written by FR. Basile Nahas on August 28, 1918. An Arabic letter handwritten by FR. Basile Nahas on August 18, 1913. Confirm birthdate of Sultana [Sultain] the wife of Elias Youssef on November 2, 1893. A birth certificate, issued by the City of Cleveland, certifying February 24, 1906 as the date of birth for Julia Courey. It lists her place of birth as Bolivar Road, Cleveland, her mother's name as Sophia Nahas and father's name as Abraham Courey. 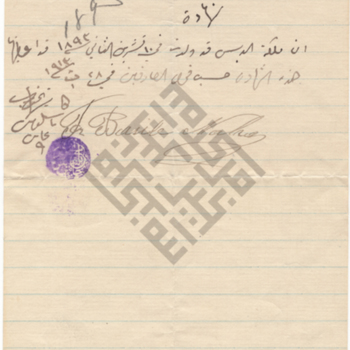 A letter in Arabic handwritten on January 6, 1914 by FR. Basile Nahas, Pastor of Saint Joseph Church. It confirms the birth of Khutar Eid Souri on December 12, 1896. Souri's place of birth is illegible.